Directed by Chris Boger, mastered in HD from the previously unreleased and uncensored 35mm negative. This visually sumptuous film is a dark tale of sexual depravity and Sadean excess, and is the first feature length film shot by Academy Award-nominated cinematographer Roger Deakins. Koo Stark stars as Justine, a virtuous innocent whose chosen path of goodness is constantly thwarted by her amoral sister Juliette (Lydia Lisle), whose debauched lifestyle is her only source of happiness. 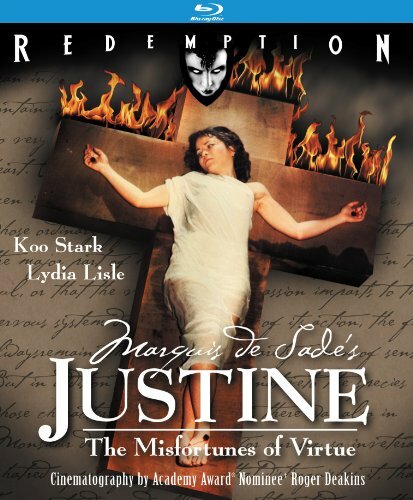 New York, NY - April 20, 2012 - Kino Lorber and Redemption proudly announce the Blu-ray and DVD release of Marquis De Sade's Justine: The Misfortunes of Virtue (1977), directed by Chris Boger, mastered in HD from the previously unreleased and uncensored 35mm negative. This visually sumptuous film is a dark tale of sexual depravity and Sadean excess, and is the first feature length film shot by Academy Award(R)-nominated cinematographer Roger Deakins (The Shawshank Redemption, No Country for Old Men, True Grit). Justine (1977) streets on April 24th with a SRP of $24.95 for the Blu-ray and $19.95 for the DVD. Both the Blu-ray and DVD come packed with special features, including an interview with director Chris Boger, an interview with screenwriter Ian Cullen, alternate title sequences, a theatrical trailer and photo gallery. Koo Stark stars as Justine, a virtuous innocent whose chosen path of goodness is constantly thwarted by her amoral sister Juliette (Lydia Lisle), whose debauched lifestyle is her only source of happiness.